Many people ask me what I do during the "getting ready" portion of the day. Besides photographing the bride putting on her dress, shoes, jewellery, and make-up, I try to photograph every single person she is with -- her mother, sister, bridesmaids, dog, whomever happens to be there! In this case, the bride was to be married on her grandfather's personal farm near Lindsay, Ontario. He was there to help set up for the vent, and also to get himself ready for the day. I pulled him aside to a large window and asked him to continue the process he had already started, only in the beautiful light I had chosen for him. Photographing a grandparent on a wedding day is so important as their time remaining on Earth may be quite little. 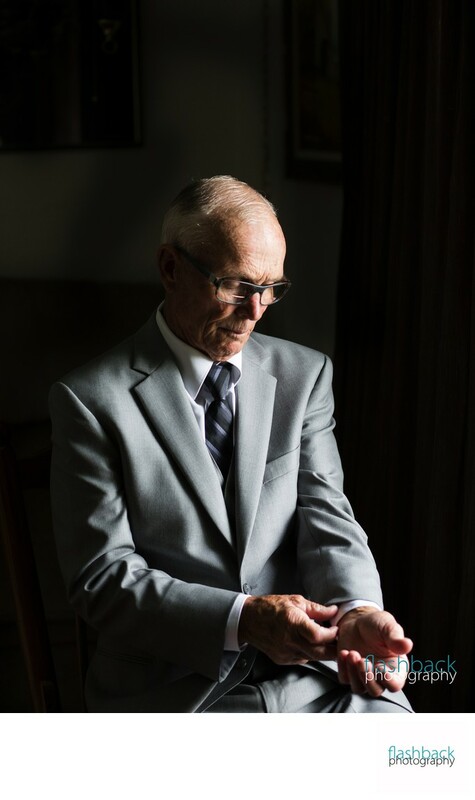 As an Ontario wedding picture photographer, I take my responsibility very seriously and spent extra time with this grandfather for that exact reason. While this wedding photo is precious to the bride now, it will take on a priceless meaning when this fine man passes, in the future.